#YouTubeIsOverParty was trending on Twitter after Phil DeFranco posted a video entitled YouTube Is Shutting Down My Channel And I’m Not Sure What To Do. What happened is that YouTube changed their notification system to more directly inform their users of videos they are demonetizing, leading many YouTube creators to discover several of their videos flagged. While these advertising-friendly guidelines have been around since 2013, they were difficult to find and users ended up not realizing that their videos were being demonetized. The guidelines are outlined under their Partner Program & Security section. These policies are worrying a lot of YouTubers. 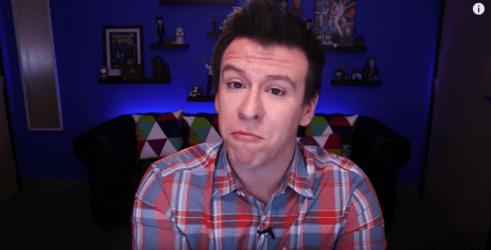 Phil DeFranco has posted a follow-up video regarding YouTube’s response, and videos from the ETC Show, I Hate Everything, boogie2988, Kubz Scouts, h3h3Productions, and many others display a very similar worry about YouTube censoring them due to the inability to monetize their videos with topics deemed unfriendly from their algorithm. While critics of YouTube’s advertiser-friendly content guidelines claim censorship, others such as Forbes’ claim that it isn’t the case at all because content creators can easily contest and reinstate monetization on their videos. However, plenty of YouTubers receive the majority of their views – and thus, the majority of their advertiser revenue – within the first day or so of posting their video. Having no revenue in that time can be crippling to those who rely on their YouTube channels for income. And as the vlogbrothers found out, YouTube’s current version of their algorithm flagging these videos down is a bit aggressive. Avoid any vulgar language in the content’s metadata. The metadata includes the title, description, and tags. Avoid anything overtly sexual in the content’s metadata. 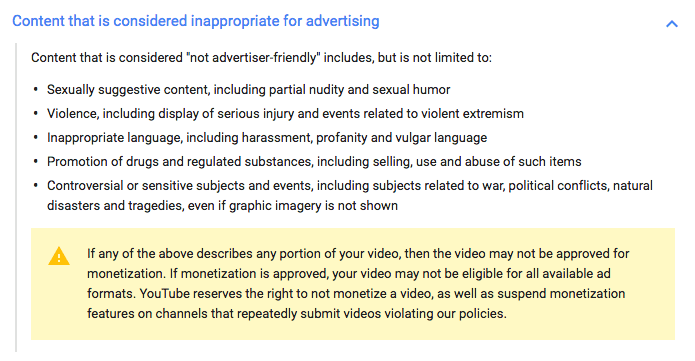 Unfortunately, YouTube’s last policy considers anything controversial or sensitive inappropriate for advertising. As many YouTubers such as Phil DeFranco, TheYoungTurks, and others cover current events on their channels, it is difficult to see how these YouTubers will continue to be able to make money with these videos about the news without triggering the bot. We here encourage video content creators to continue making videos about the subjects you love to do while YouTube smooths this out. In the end, it will be the content creators and their satisfaction with a platform that determines where they will post their content – and in many cases, their audience will follow them. I respect all guidelines so long as they are pre-inform I will do my best to comply, even if it sounds unfair. However what is hard to accept is YOUTUBE team not competition to create their bots or automation or algorithm which is proven useless. For example if a title of a song contains the word ” cover” immediately their bots think someone is covering someones copyrighted song and thus demonetise it. Sending an appeal does not work because they don’t have the staff to check the tagged video and override their bots. Instead they say, we will check only after your video gets 1000 hits. Really why 1000? because the money for the 1000 hits they wanted to keep it for themselves 100 % without sharing. If they did not make this particular extra conditions, video creators need not be suspicious. For us who does not know how to make own sites for advertisers to sponsor, we have no more hope as alternative to youtube so far are slow and hopeless too.